For musicians who were just entering their prime around the midway point of the Twentieth Century the future was looking decidedly uncertain all of a sudden. The career options which had existed more or less for decades in the recording era were in the process of undergoing a rather substantial change with the advent of rock ‘n’ roll in the late 1940’s. Of course rock’s arrival wasn’t alone in upending the direction of popular music during this era. Equally at fault was the rapid decline of big band jazz as the dominant form of American music which had the effect of putting a lot of skilled musicians in search of employment. With big bands slimming down to smaller combos and the concurrent rise in the role of the vocalist as the most prominent aspect of pop records the top-flight musician no longer was in the spotlight, save for a few holdovers whose names as leaders of their outfit was strong enough to carry on even if it was with diminished commercial expectations. But for many others who had been so vital to the sound of the most popular brand of music over the past twenty-five years they suddenly found themselves deemed somewhat expendable. So some of them, in fact more of them every day, turned a reluctant eye towards rock as their possible salvation. We’ve met a fair number of these cats already. The list of ex-jazz stalwarts trying their hand in rock is a long one with Tom Archia, Hal Singer, Joe Morris, Manhattan Paul Bascomb, Earl Bostic, Tiny Grimes, Todd Rhodes and a whole host of others venturing into the rock field, either by intent or happenstance, some quite successfully and some who found it too uncouth for their tastes and quickly made their exit and went back to safer confines. You look back at this with a sense of incredulity that so many established musicians seemed cast adrift during the exact same two year period even though the jazz market was still being heavily promoted (far more so than rock overall, and within the major labels it was almost as if the younger upstart style didn’t even exist), yet with the benefit of hindsight we can sense the inevitability of it all. Of course this was bound to happen, you say to yourself. If not rock ‘n’ roll then surely some other form of quasi-legitimate music that might’ve otherwise emerged would’ve claimed these men. With the number of opportunities dwindling in the style they were accustomed to and with the increased demand for more records to cater to the growing enthusiasm in the younger black marketplace for such uncultured sounds as rock offered, the question wasn’t IF they’d find their way into this field, but rather WHEN they would and how long would they remain. The majority of those migrating from jazz to rock were saxophonists, though you had some trumpeters, guitarists and pianists thrown in for variety’s sake. Now we’re meeting a drummer who’s doing the same and one who, depending on how you look at it, would arguably make an even greater impact in rock than most of those aforementioned names, even if his own name remained hidden in the shadows, lacking widespread public recognition and devoid of any credited hits. The career of Panama Francis isn’t lacking for much else though, because over a half century he tackled just about everything at one point or another. Big band jazz was in many ways the defining music for drummers, introducing virtually all of the stylistic precedents, from playing style to the drum kit set-up, that the instrument became known for over the rest of the century. 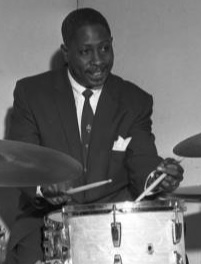 Yet in spite of their crucial role in popularizing the instrument the number of drummers who had risen to star bandleaders in jazz numbered in the… well, aside from Chick Webb almost zero. Buddy Rich, Kenny Clarke, Max Roche, Jo Jones, some of the greatest names who ever picked up drumsticks, certainly weren’t unknown but they made their names working behind others almost exclusively in the 1930’s and 40’s. That’s not to say nobody got a chance to head their own outfit but those who did rarely matched the acclaim they got backing others. Gene Krupa was the most famous drummer in the world and as such led his own group for years with some notable success but was still more revered for his earlier work with Benny Goodman’s Orchestra. Art Blakely was just starting to work as a bandleader at the tail end of 1947 but he too was far more renown for his supporting roles. So it’s not that it couldn’t be done, but rather it didn’t make sense to do so simply because of the nature of the instrument itself. The drums were best used as an accent piece to a larger ensemble, absolutely vital in the arrangements but not something designed to carry the melody which is what those bands specialized in. Yet as that style’s commercial run drew closer to an end the opportunities for new drummers on the scene were drying up. Fewer bands meant fewer jobs and so a good many musicians (as we’ve already seen it was hardly just drummers) turned to session work. But what kind of sessions? The best jazz bands were still together, maybe with diminished expectations on the charts but they weren’t jettisoning their established personnel for fresh blood. Pop would seem to have use for the best musicians available but they were still recording with larger studio orchestras who weren’t making room for iconoclastic jazz refugees. The blues and country realms were insular musical communities with unschooled practitioners providing an authenticity that couldn’t easily be replicated by those outside their field. Rock ‘n’ roll on the other hand was someplace where skilled musicians could conceivably “dumb down” their playing styles to cut songs that were simple and direct, flashy if need be, but which at least had a rudimentary connection to the dance bands so many cut their teeth in. So in time there came about a gradual migration of those who’d been working their way up the jazz ladder before its rungs started falling off. Names who hadn’t become headliners yet but had the market not drastically changed they would’ve been stars in that field in rather short order. Now they were left to scramble somewhat for gigs and so when an independent label like Gotham Records who’d had success already with this kind of music came calling, offering you leader scale for a handful of instrumental sides which conceivably may just be taking up space on their release schedule but which might find an unlikely audience if things broke right and in the process get you some name recognition and gigs, it was a hard offer to pass up. Panama Francis would go on to a long and ultimately very successful career in this admitted “sideline” of his, that of a rock session drummer. But for all of the hits he played on – and there were certainly a lot – he was oddly enough not the featured soloist on Stompin’ With Panama nor was he even the most significant new recruit to rock ‘n’ roll playing on the session. That role would go to Sam “The Man” Taylor, saxophonist extraordinaire. 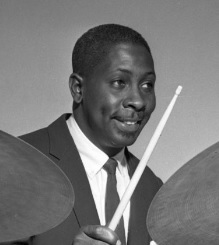 While Francis was always a jazzman at heart, remaining a first call session drummer in that field and cutting Grammy nominated jazz albums in the 1980’s as the leader of the Savoy Sultans even as he was moonlighting as a rock drummer in the studio, Sam “The Man” Taylor would wind up giving his life to rock ‘n’ roll. He might not have been enamored with it any more than Francis was, but Taylor became the most recorded sax blower of the 1950’s rock scene, his sound defining the era and overshadowing anything else he ever took part in. Stompin’ With Panama would seem to suggest this was bound to happen. 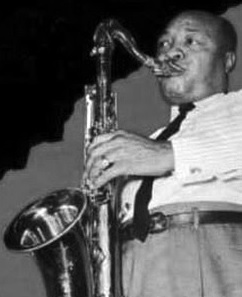 For starters of course the sound of late 1940’s rock was built on the tenor sax, not the drums, and so Taylor was simply fitting into an already established framework. Furthermore the drums were just not quite cut out to be a soloing instrument other than a spot or two on the bandstand to whip a crowd into a frenzy, and so on record the drummer wasn’t going to be carrying an entire song with his playing no matter how good or inventive he was. As a result Francis’s role here is actually fairly minimal and what he does play has more to do with jazz technique than the beat heavy role rock would assign the drummer as time went on. Consequently this is really a schizophrenic song by nature. Part jazz, part rock. As we’ve found out more times than we care to remember, hybrid songs of this nature rarely work out well. The milder jazz or pop concessions leave rock fans bored and wanting to bust out of the emotional straitjacket they find themselves fastened in, while the jazz fan runs screaming for the exits once the rock attributes get accented and threaten to blow the roof off the joint. It’s no different here as the first minute, with Francis modestly riding the cymbals as the saxophones gently swing, is threatening our sanity. When the trumpet comes in to handle to first solo our patience is already nearing a breaking point. For rock fans who seek out records to help them lose control of their senses, this kind of sound dulls their senses and causes them to lose their minds instead. You could conceivably take the first minute and twenty seconds back in time five years and nobody in 1944 would likely notice the difference. But then the pianist apparently sees ants crawling over his keyboard and starts to more emphatically pound the ivories in an effort to squash the intruders… how else to explain his sudden assertiveness? Taking this as a cue Taylor jumps in and starts blowing a more urgent riff. His playing is strong and best of all it’s focused, something that many jazz-reared sax players slumming in rock have trouble doing. While he doesn’t try and knock one out of the park with any wild displays as the more flamboyant sax anarchists who’ve fully given themselves over to the sinful world of rock ‘n’ roll have learned to do, he keeps it suitably grooving, never letting up and pulling the others along with him in the process. Francis now make his presence more known thwacking the bass drum with regularity as a capper to each line. The other horns when they rejoin the proceedings are playing in tight formation, keeping it simple but thankfully all headed in the right direction. There’s no atonal squawks from a particularly rambunctious stray horn, no flighty passages designed to impress their brethren who are giving them bemused looks from the sidelines for taking on this job in the first place, and there’s no let up in the driving riff. None of Stompin’ With Panama is standing out by any means, but maybe that in of itself is cause for celebration because it’s not standing out in a negative “I can’t believe we’re reduced to cutting such simplistic crap to earn a living now” way either. They all seem reasonably committed to delivering what’s expected of them and if it’s not exactly cutting edge, must-hear stuff, it’s also not inspiring a mad rush to the jukebox to pull the plug on the record either. Considering that much of what Francis and company were laying down for Gotham during these sessions was much closer to what their backgrounds would suggest was their preferred method of playing this song comes across as more along the lines of a compromise track. Whether it was the label pushing for something a little more commercial or whether it was Francis himself hoping to expand their possibilities in the future by exhibiting a bit looser approach than the jazzier sides to get him some credibility with a different audience, it’s hard to say and I’m not sure it really matters. Whoever was responsible might not have even seen the writing on the wall, certainly it’s doubtful any of them fully expected that the changes already witnessed on the music scene over the past two years was going to continue unabated for the rest of eternity (or something close to it), but inadvertent or not this marked the first step they, and those like them, would be taking over the next few years as rock increasingly took hold. I’d be willing to bet if you asked Francis and Taylor on their way out of the studio after cutting this if they thought their careers were going to find them increasingly having to not only match this type of stylistic approach, but improve upon it, they’d have scoffed. But interestingly, at least basing it on the sound of this and their long associations with the music of tomorrow, they wouldn’t have been outright dismissive of it either and that in of itself was promising. It may not have been what either would’ve played if they’d had their choice, but in music, like swimming, it’s usually smartest to just go with the tide and by now it wasn’t hard to see that the currents were flowing in the direction of rock ‘n’ roll. Leave a reply on "Panama Francis: “Stompin’ With Panama”"